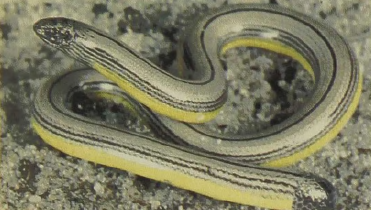 The coastal regions of southern California and Baja California are the home of these legless lizards, a term that by now will be seen to have minimal descriptive value. These lizards, which are 8 to 10 inches long, occupy loose sandy areas and have become sand swimmers rather than borrowers. They pass through the sands by lateral undulation, detecting their prey mainly by smell both underground and at the surface. Like the amphisbaenians, these snake lizards require a fairly humid soil and will often dig down to levels at which the soil starts to be moist.